We often read this iconic ‘RHS’ acronym, badging many gardening events. However, what is the RHS? The Royal Horticultural Society (RHS), was founded in 1804 as the Horticultural Society of London. It was suggested by John Wedgwood (son of Josiah Wedgwood, of pottery fame) in 1800. Wedgwood discussed the idea with his friends, but it was four years before the first meeting, of seven men, took place, on 7 March 1804 at Hatchards bookshop in Piccadilly, London. The society was formed at this meeting. Today, the RHS is the UK’s leading registered gardening charity, with an ever-expanding RHS membership (485,000 as at 12th July 2017). Its headquarters is, 80 Vincent Square, London SW1P 2PE. Its purpose is to promote gardening and horticulture, whilst also supporting training for professional and amateur gardeners. The RHS promotes horticulture through flower shows including the Chelsea Flower Show, Hampton Court Palace Flower Show, Tatton Park Flower Show, Cardiff Flower Show and the RHS Malvern Spring Festival (10th to 13th May, 2018). 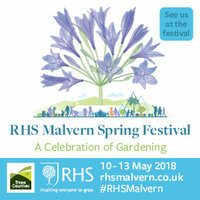 Brilliant Wall Art are attending the RHS Spring Festival at the Malvern Three Counties Showground, with their extensive and continually expanding range of wall art, home and of course...garden accessories. Check out our stall (no. 2012) for extra special festival offers exclusively for you, at this Malvern Spring Show. Take a look at our brilliant garden products here, on our BWA website. We have everything from garden accessories to garden furniture. My personal favourite is the modestly priced Garden Mirror Wall Planter. It is a really useful wall mounted flower pot storage space or planter, ideal for any garden. It has a distressed aged effect finish, with oval mirror detail and designed to look old with imperfections to add charm and character. Please ring our friendly staff to check if your required item is in stock to view at our stall (no. 2012) at the Malvern Spring Festival 2018. Brilliant wall Art will have an extensive range of metal wall art at our stall, for indoors or outdoors, our range is superb. Visit our Brilliant Wall Art stall (no. 2012)…Karen and Simon will have great pleasure presenting BWA’s superb gifts to you and your family.